We have been practicing since last term for our perfomance at the Flava Festival today. 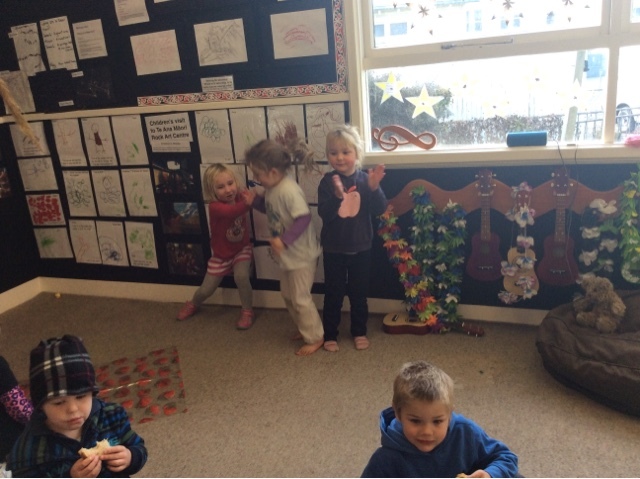 The children showed fantastic perseverance in learning the actions to the Matariki song and finding humour when sometimes we turned in different directions from each other! 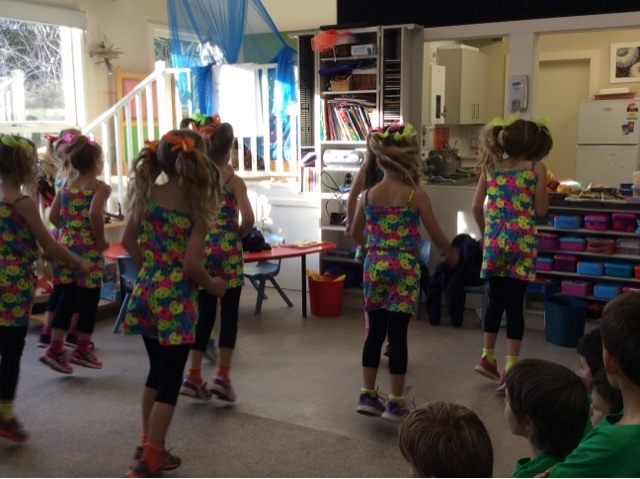 The Kotahitanga Jump Jam routine is something that the children love particpating in as part of our daily morning routine. It was great to share this with the wider communty. 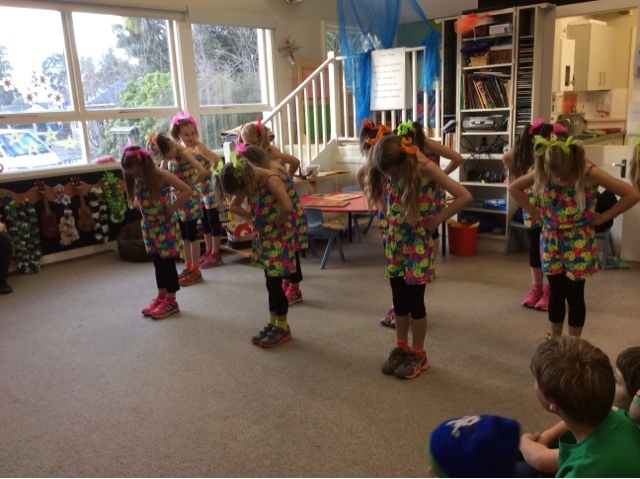 This is their favourite contemporary Māori dance routine and their enthusiasm as they performed was clearly evident. 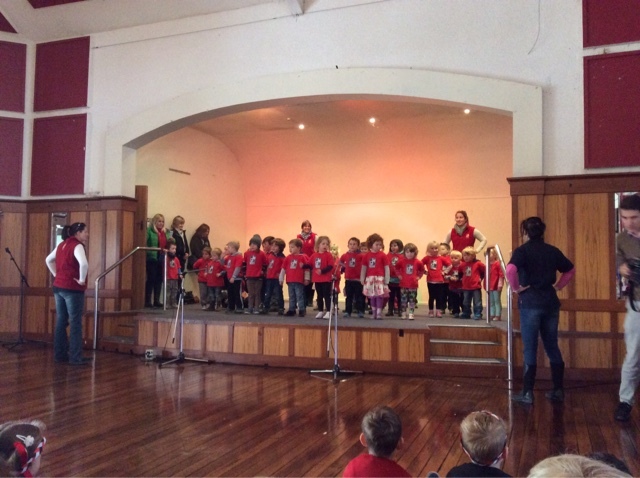 Children took responsible risks to be able to perform in new surroundings and in front of a very large crowd. In turn, we watched several other performances by other groups. 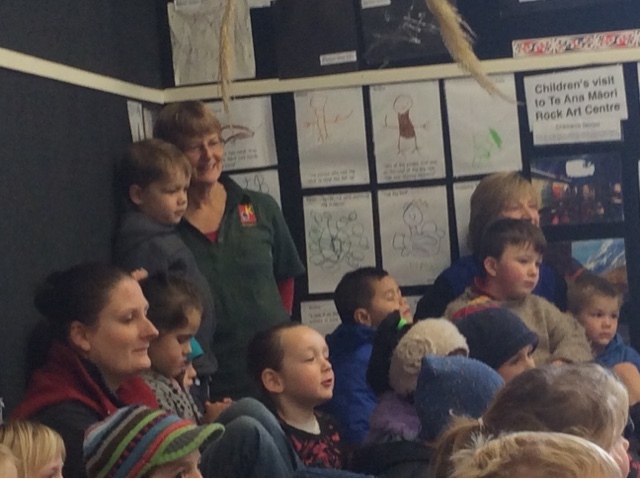 The children showed Manaakitanga, care and respect by listening with wonderment and awe. We are respectful, we listen, we learn. He rōpū manaaki, he rōpū whakarongo, he rōpū ako mātou. This type of event allows us to see how the Habbits of Mind are sustainable in bi-cultural way. There's an emergency at kindergarten. While working inside with a group of children I heard a group of children yell, there's an emergency, and as quick as I could turn around there was a blue bed being carried past by a group of children. 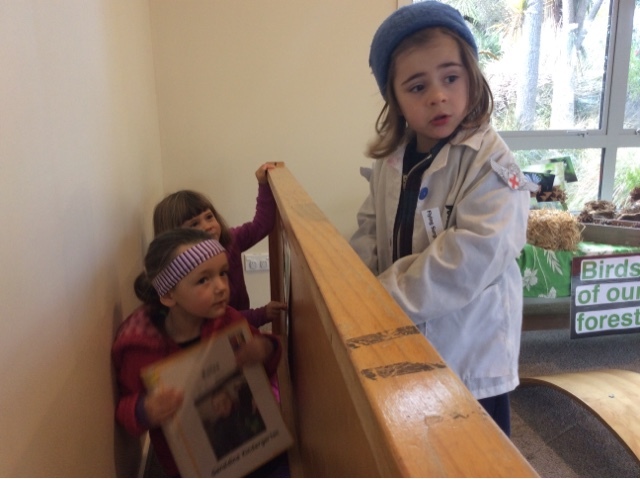 As they children Mahi Tahi/ worked together to carry the stretcher we followed with interest to see what the emergency was. Doctor Billy shared that Tash was having a baby and she needed to get to the hospital fast. It wasnt long before Tash had a beautiful baby boy. 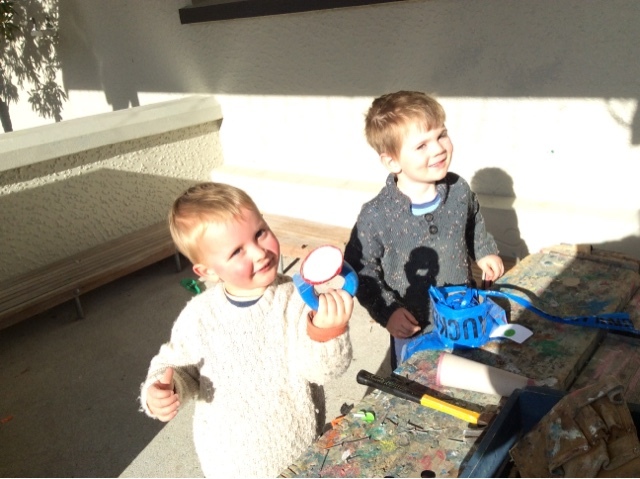 After exploring this Idea Archie decided to take some xrays of lots of his friends at kindergarten, firstly they explored what different kinds of accidents could happen that would need xrays, like falling of your bike and breaking your arm. 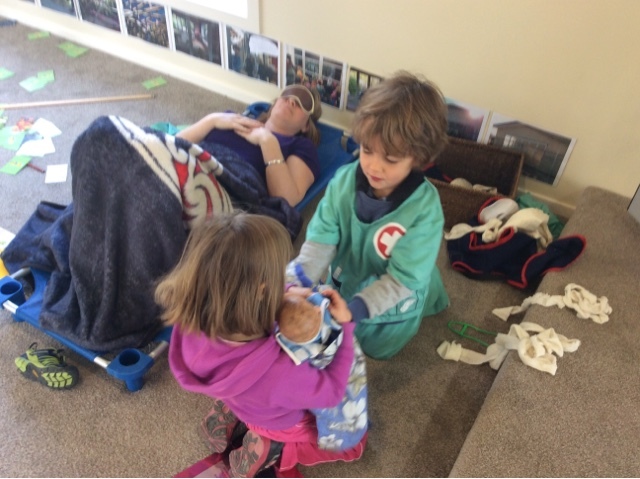 the children clearly articulating their ideas to each other and showed lots of manaakitanga, care and respect as they got different friends to sit behind the 'xray machine' so they could take an xray. This is great,he rawe tēnā! "It hurts in her arm" Violet shared as they had me sitting in the xray machine, Billy quickly added "Get on the stretcher, your hurting remember" and they made me get onto the stretcher so they could get nurse Violet to fix me. It wasnt long before I heard Violet share "I need to put the baby in the xray, can you please turn the xray machine on doctor". After a while I was curious to know what was wrong with the Baby so I asked "Was the Baby okay?" Doctor Billy and Archie were quick to share "The baby had an xray but nothing was wrong, we do them sometimes and nothing is wrong." 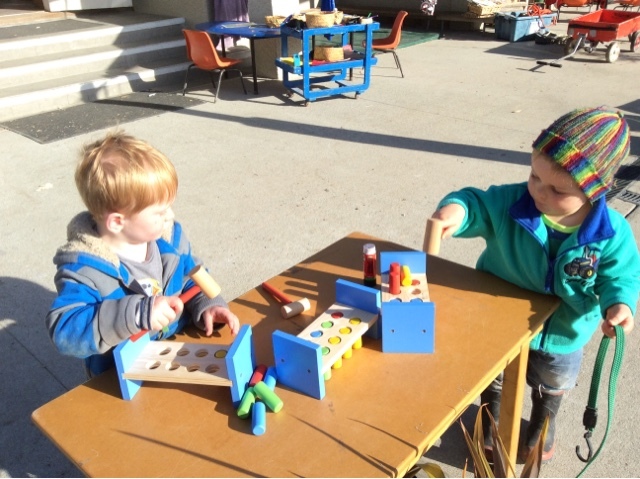 Pretend play is a fantastic way for children to explore their ideas when they know they are in a safe environment. 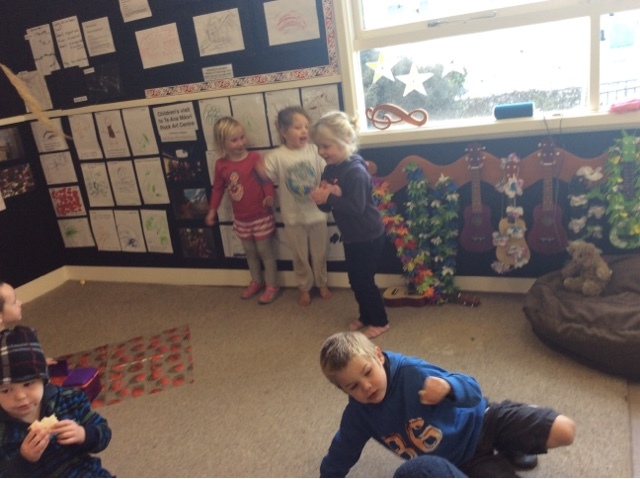 This week parallel play has continued in our afternoon session, as the children continue to build whanaungatanga/ relationships and get to know each other. 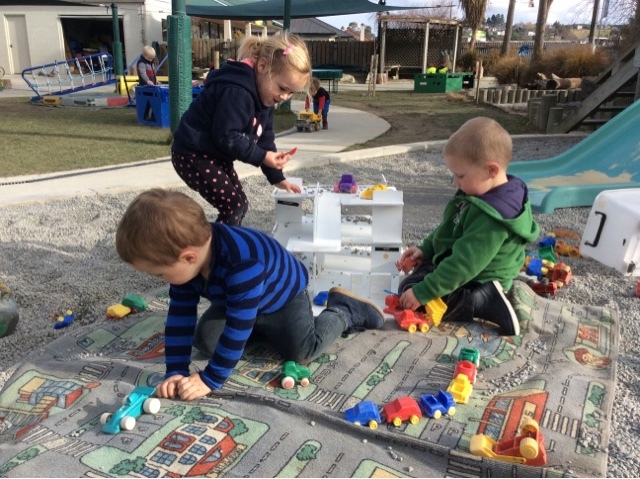 As the children explored the cars and tip trucks on the car mat, they enjoyed filling the truck trailers up with stones and transporting them. 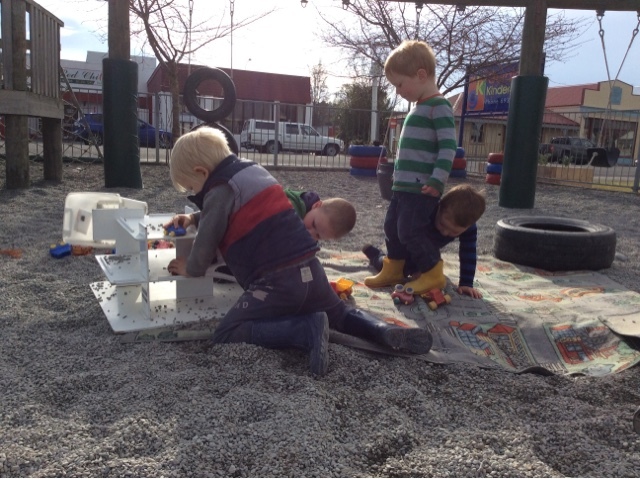 Parallel play is completely normal at this age and it helps the children to develop trust in each other as they work happily alongside each other, building the knowledge that no one else is going to take the toy they are playing with, without asking. As the children played Malachi commented, "he gave that to me, good sharing". Ka rawe, how lovely. 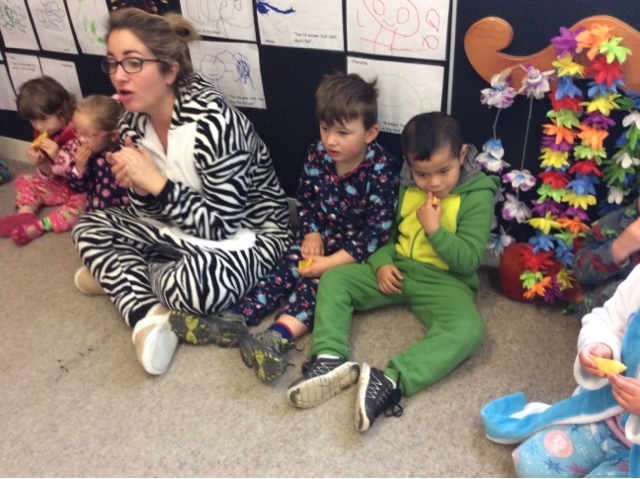 Just like Malachi recognised in Paxton all the children showed fantastic manaakitanga/ care and respect towards each other. 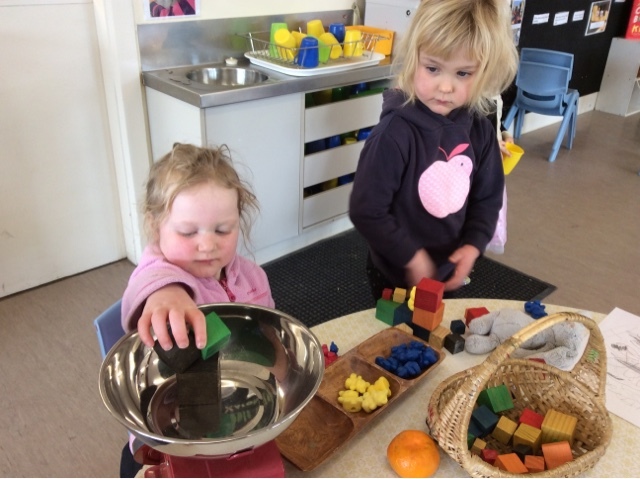 Children followed their own ideas while watching what the children around them had been doing and using these ideas in their play. Opportunities like this parallel play today help children to begin developing whanaugnataanga, relationships as they start to take responsible risks and play with the children around them. Today teachers provided 3 different types of scales that the children could explore using different items around the kindergarten - kitchen electronic, mechanical scales and some bathroom scales. 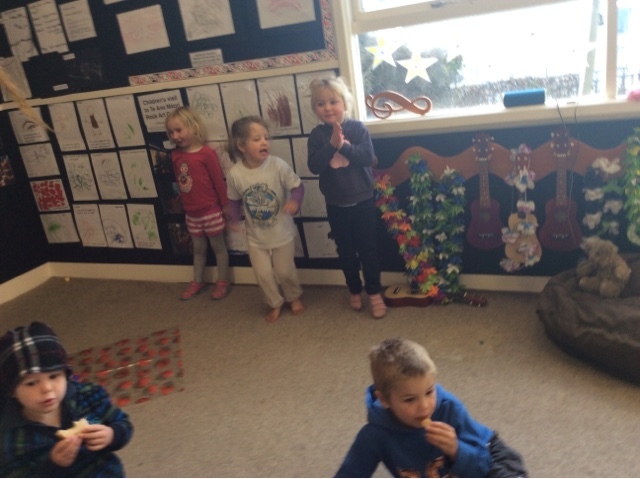 Throughout the morning children used the scales in different ways to support their own interests at that time, like Bailee who weighed an orange and a manderin before preparing to share with her friends at kotahitanga. With some encouragement Bailee, Pippa and Ginny estimated which piece of fruit they thought would be the heaviest. 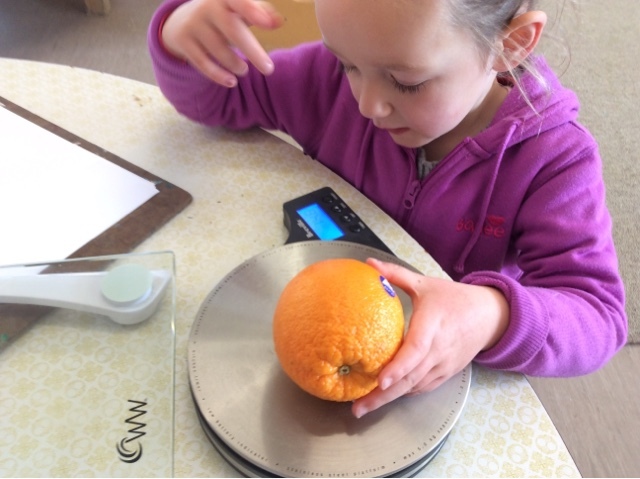 All girls pointing to the orange, so we put it on the electronic scales, it was 278grams and the mandarin was 134. We wrote down the numbers as they came up on the screen for the group to see on paper. So now we have weighed them which piece of fruit is the heaviest we asked, "The orange" Pippa relied! Providing these resources was a result of conversations that the teaching team had around play yesterday (outlined in previous BLOG post) where intentional teaching strategies were set to explore, plan for and provide experiences that encourage exploration of different mathematical concepts within all areas of children's play - ensuring that it is relevant and meaningful to the context they are in. - We will increase the use of mathematical language that we use with children to expand their understanding and support their ability to apply it in real play such as measuring the length of different equipments, comparing different shapes, sizes or lengths. - We will do this by setting up problems that use mathmatical systems, symbols and tools to solve the problem. 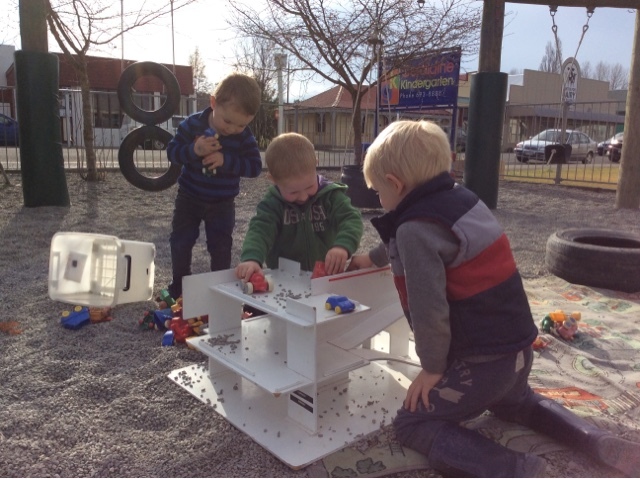 - We will ensure that there are relevant mathematical tools in different areas of the Kindergarten for children to explore and use in a purposeful and meaningful way, for example Scales in the play dough area, tape measures in the carpentry. - As we continue to observe and work with children in their play we will continue to reflect and plan forward for their continuing interest. Taken from our morning group planning, term 3 2015. This morning Archie, Tom and Addisyn began exploring the ideas of doctors, asking me for resources such as the blue bed they know is out in the back store room so they could use it for their patients. 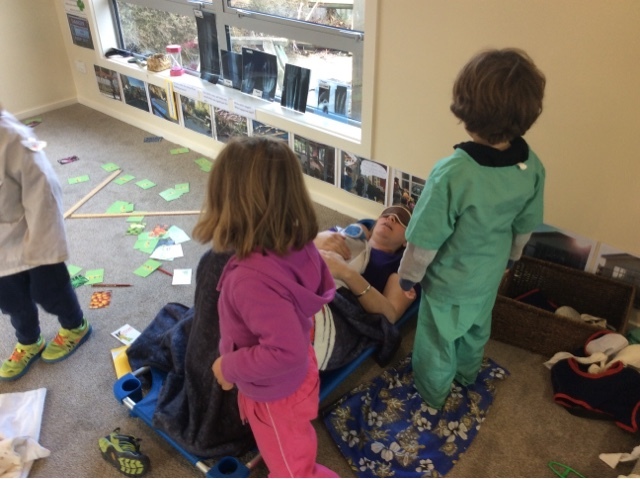 Their medical based play with Tash, the patient ( Maddie's Mum) as the doctor play continued Tom and Archie were excited to then see how tall Tash was and see if she was growing after her accident. Kātahi te whakaaro pai, thats a good idea. This idea was sparked by the discovery of some one metre rulers that they found on the shelf, and this then provided a great avenue to get a large roll of paper and draw a line above each others head so we could see who was taller. Tash started by lying down on the paper and Archie and Tom took responsibility for drawing the line above her head. 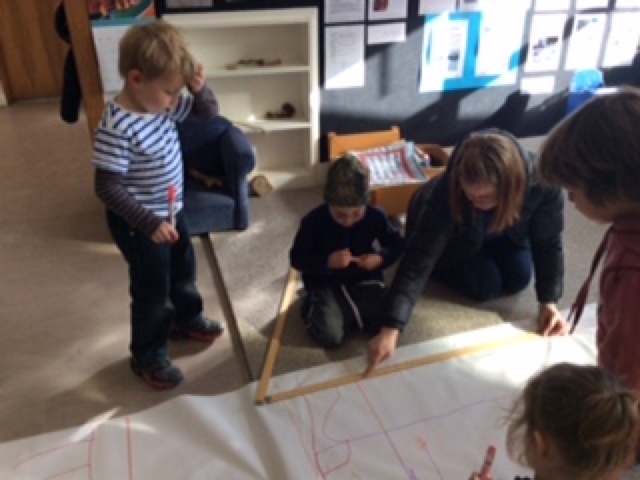 Other children naturally became involved, like Violet, Kayne and Macy also began exploring how measuring each other and the concept of different heights. 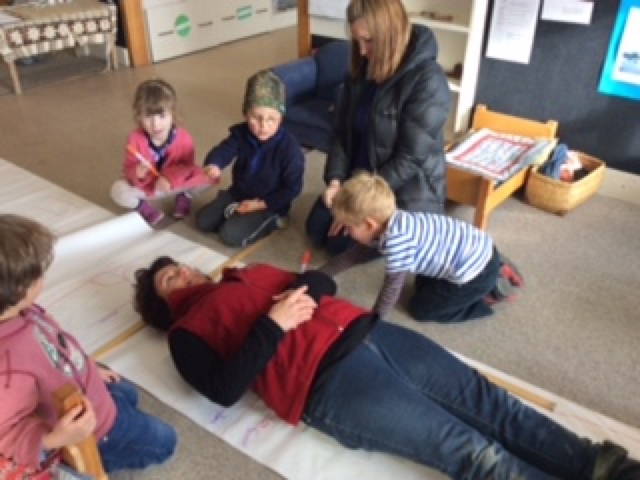 We each took turns lying on the paper to see how high the line would be, what height we were and what numbers and measurements resembled the height of each child and teacher. The children become very excited to guess what adult was going to be the tallest, after measuring Tash, Archie approached Heather "Heather can we measure you?". So quickly they went to were the large piece of paper was so that they could guide Heather as to what she needed to do next. Tash asked the children if they could estimate if Heather was taller than her or not. The children all took a responsible risk by estimating and communicating with clarity as they shared their idea. Archie and Tom then clearly articulated "You need to lie down on your back, with your feet against that stool" ensuring that they were striving for accuracy. So Heather quickly followed instructions and put her feet against the stool. "Oh no, your feet have moved" Tom shared as Heather lay down. "You need to shimmy down the paper" added Archie. The children then put the one metre ruler above Heather's head and drew a line, celebrating quickly that their guess was right Heather was taller than Tash. That’s good thinking - He pai koe ki te whakaaro pena. 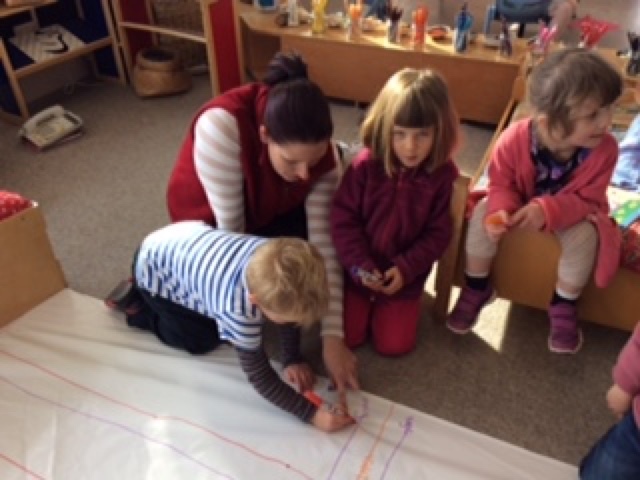 As the children began measuring Heather's height and comparing it to the line they had drawn for Tash's height, Tracey walked in the door and the children were very excited to compare if Tracey was going to be taller or shorter than Heather was. This was when the estimating began again and children started guessing and articulating their thoughts and ideas. 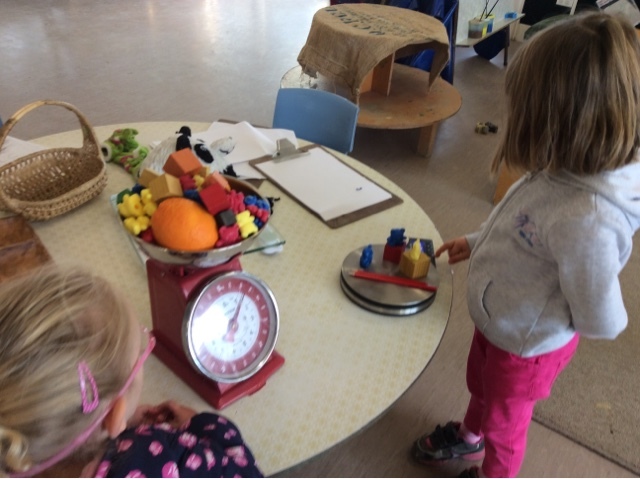 Estimations, comparisons and measurements were talked about for a lot of the morning, amongst the group themselves and calling others to join in to add to the complexity of their play. 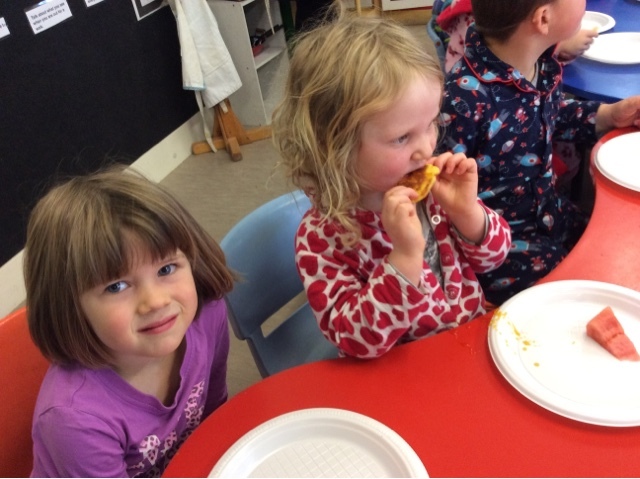 We have had an exciting start to Term 3! One of the highlights of coming back to kindergarten for the children is getting to see their friends again! 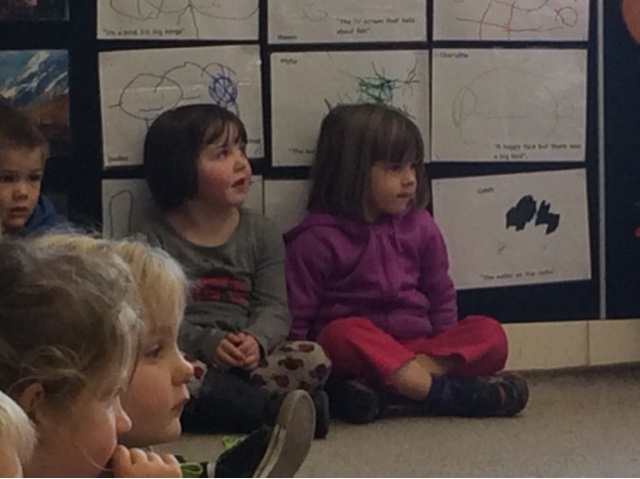 Whanaungatnga/relationships are important to us at Geraldine Kindergarten and this was definately reflected in the parallel and co-operative play in our afternoon session today. 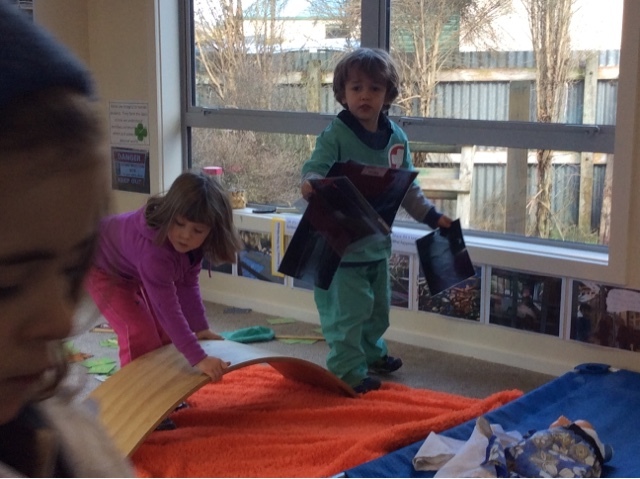 The pictures alongside this post show children in different types of play together, concentrating alongside each other as they began climbing over our bridge and finding humour as they experimented with the magnets in the carpentry area. 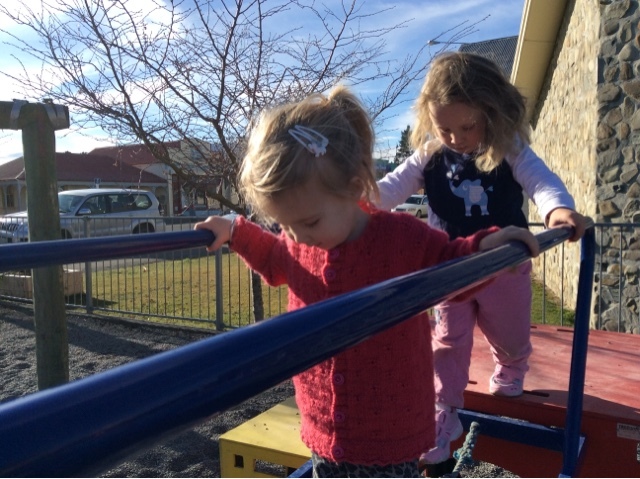 The swings are used each day at kindergarten and children enjoy showing manaakitang/care and respect by pushing each other, a great way to be actively involved - Poia te waka, mahia te mahi. The great part about developing relationships is what we learn from one another, by watching we can pick up different techniques to apply in our problem solving in play, just like Leo and Digby were doing today when using our new hammer kits! Relationships support our learning in so many ways. Last day of the term and a special dress up day was organised initially by Maddie and her Mum. We all arrived with our pj's on which created a lot of katakata/fun and laughter. Heather said there was lots of running around outside which wasjust as well because the temperature was quite cold. 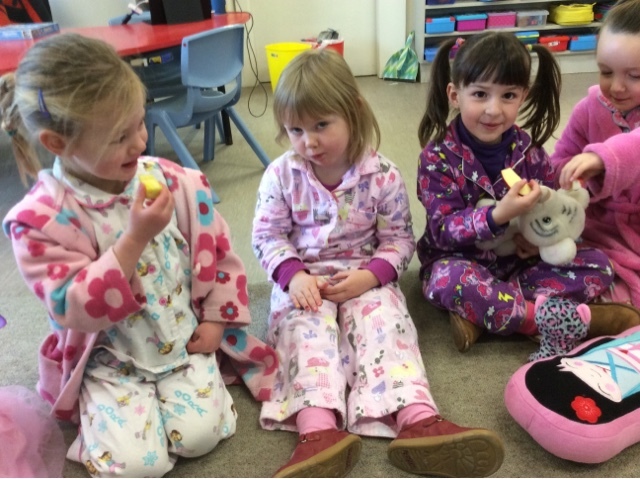 One parent commented that we should always have a PJ day and laughed as she found the dressing in the morning was not an issue that day! 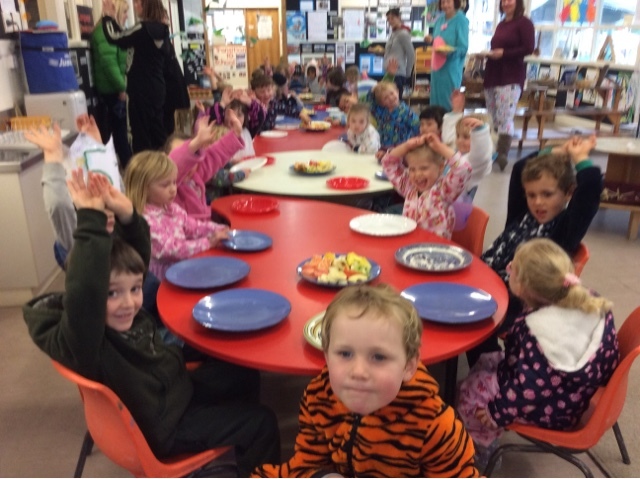 The tables were set and we are so grateful for the parent support as they made the pancakes that smelt so delicious. The fruit and the maple syrup was offered with the pancakes and made the day a very special day. We started our Kindergarten day by doing our own Jump Jam song called 'Who let the dogs out!' 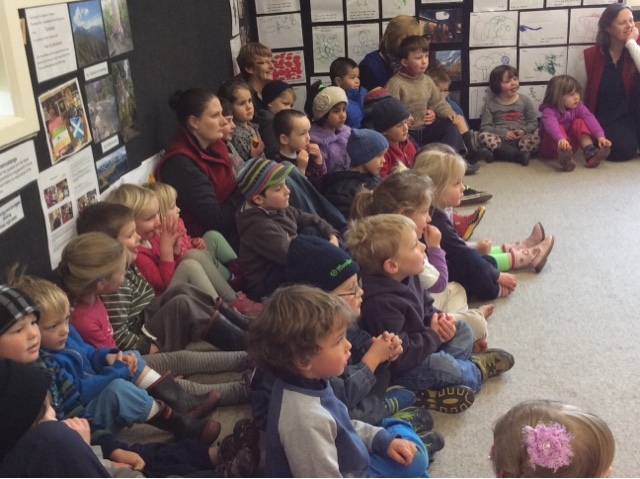 We had an audience from the Geraldine Primary School. 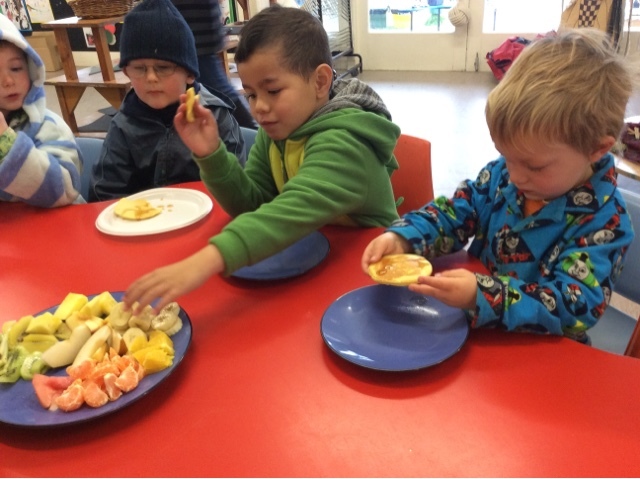 Being all together we continued with our daily routine of kotahitanga; our mihi and karakia and finished with sharing fruit with everyone. It was such a wonderful way to greet our visitors. Then it our turn to be the audience and with wonderment and awe we saw some wonderful costumes, delightful faces, and dancing beyond our expectations. James said, "I can do those circles but I can't do the rest of it!" 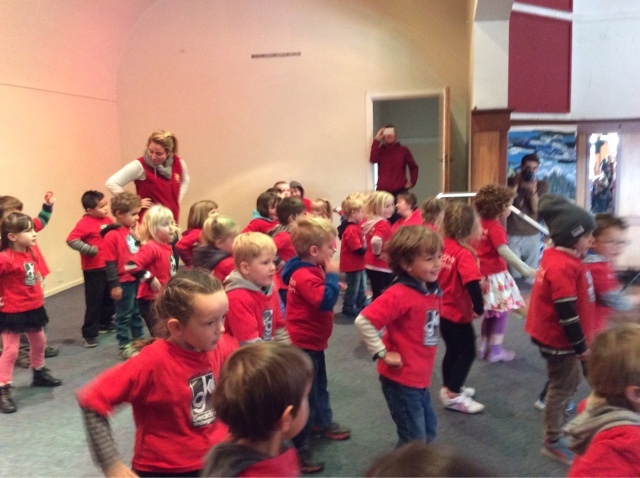 There were three groups that showed their ability to mahi tahi/work together to entertain us! After our visitors left there was a flurry of excitement! Tayla said, "He's (Teddy) going to sit here and be the audience!" Pippa continued, "Yes, and we're going to try to do that, try some of those moves!" 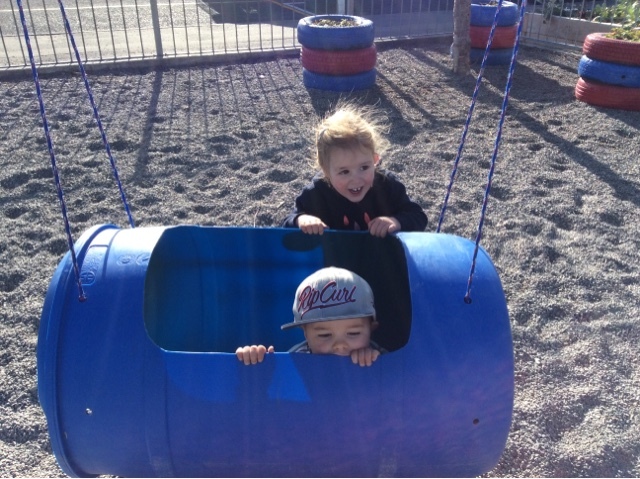 The children look, listen and then willingly give things a go - they are risk takers!